I don’t know about all of you, but after nearly a month of holidays and delicious food, I am *so* ready for some healthy eating! My best diet tip is to fill up on lots of delicious veggies – it makes you totally not miss the fattening and unhealthy stuff! I figured some of you could probably use some great veggie ideas, right? 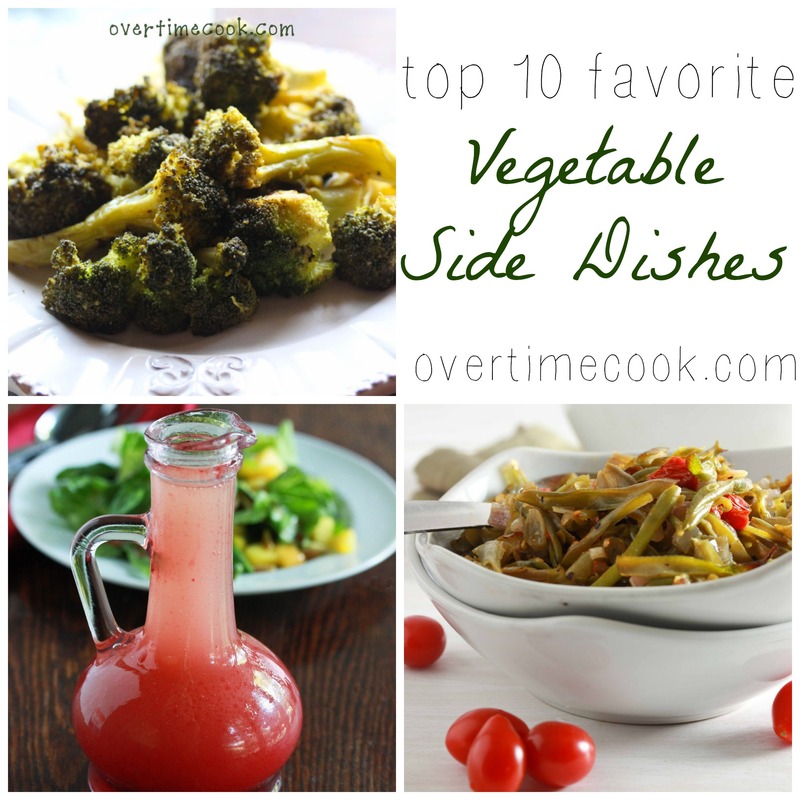 Well, here are my top 10 favorite vegetable ideas! Click around, enjoy, and stay healthy! These spicy baked zucchini sticks are the among the most popular recipes on my blog (second only to my Healthy Pumpkin Pancakes) and for a very good reason. Sure, these zucchini sticks are delicious. And yeah, they’re easy to make. And of course they’re healthy. But the thing people love about them is the trifecta. Delicious, easy and healthy. It actually is possible. Another one of my blog’s favorite recipes, and also with great reason. This recipe will help satisfy your breaded, deep-fried craving in a relatively healthy recipe. A few whole wheat bread crumbs really transform this dish into a treat – one you won’t believe it’s healthy! Isn’t it a shame that a vegetable as delicious as sweet peas gets such a bad rap? Well, this is a dish guaranteed to change your mind about peas! This dish has a fabulous secret – I’ll share it, but don’t tell anyone. Deal? It totally works with frozen green beans. That means it’s totally easy to make and works in all seasons! Well this isn’t exactly a vegetable dish, as much as a delicious way to dress your vegetables. But of all the delicious salad dressings I’ve tried, this one is definitely the most unique. It’s got a very interesting secret ingredient that will keep your guests guessing! This is one of the blog’s early recipes, but it’s still one of my personal favorites. This recipe is great proof that simplicity is the best. Ever wish you could come up with a fabulous new way to cook broccoli? Well the good news is, you just found it. This broccoli is insanely easy to make, delicious, healthy and totally different. Funny story about this recipe: I recently had a bunch of family over for supper, and wanted to make something healthy and delicious to serve them. Naturally, I thought of this recipe. I doubled it for the large crowd, then immediately regretted it. There was so much delicious food to serve at that meal, who needed so many sugar snaps?! Figuring I’d save the leftovers for lunch the next day, I served them on a large platter. I went back to the kitchen for something, and came back to find that the platter was almost empty! And everyone was fighting over the last few bits. Yep, they really are that good. Craving chips? Try these! Not a fan of spicy? Try them with just salt and pepper! Another favorite salad dressing of mine! If you’ve tried it in an Asian restaurant, you know how delicious this dressing is. If not, you really need to see what you’ve been missing out on! Looking for some more healthy recipe ideas? Check out this list of 15 recipes that helped me lose 15 pounds!